Your favorite creators remember their favorite holidays! We’ve developed this nice little tradition here at 13th Dimension: Comics’ top writers and artists recall their favorite holiday memories, whether they be from childhood or just a few years ago. — 13 COVERS: Happy New Year! Click here. — 13 COVERS: A Very Bronze Age Christmas. Click here. — 13 COVERS: It’s Thanksgiving! Click here. — A DON MARTIN New Year’s, by Norma Haimes Martin. Click here. — Writer ANN NOCENTI: A Daredevil Christmas. Click here. — Artist J.K. WOODWARD’S Fairytale of Los Angeles. Click here. — Cartoonist BILL WALKO: How a Rankin/Bass Classic Set the Template For Superhero Flicks. Click here. — Artist KELLEY JONES and the Most Amazing Christmas Ever. Click here. — Writer SAMUEL SATTIN: How Aquaman Saved Hanukkah. Click here. — Writer PAUL DINI: Christmas Magic With Zatanna. Click here. — Historian ARLEN SCHUMER: Neal Adams’ Silent Night of the Batman. Click here. — Cartoonist FRED HEMBECK: Flash Gordon, Buck Rogers — and Mad Magazine. Click here. — Artist CLIFF CHIANG and his STRETCH MONSTER. Click here. — Writer RON MARZ: A Fantastic Christmas With JOE SINNOTT. Click here. — Artist BRENT SCHOONOVER: He-Man and the Masters of Christmas. Click here. — Writer CORINNA BECHKO and Artist GABRIEL HARDMAN Meet Dracula. Click here. — Animator J.J. SEDELMAIER’s Batman Thanksgiving. Click here. — Editor DAN GREENFIELD: The Mego Batcave and Me — A Chanukah Fable. Click here. — Columnist CHRISTY BLANCH: 13 Wonderful Things to Watch This Holiday Season. Click here. — Columnist ROB KELLY and the Great HEROES WORLD Catalogues. Click here. 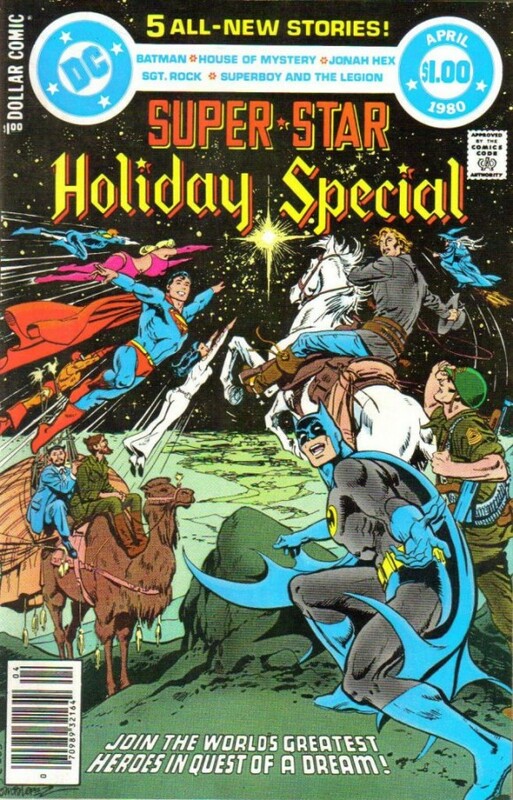 — Columnist ROB KELLY on DC’s first CHRISTMAS WITH THE SUPER-HEROES treasury. Click here. — Columnist CHRISTY BLANCH: 13 THINGS I’m Thankful for in Comics. Click here.